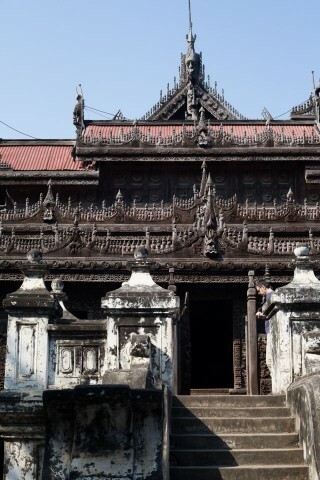 Photo: The intricate Shwenandaw Kyaung Monastery. The only surviving original building from Mandalay’s royal palace is Shwenandaw Monastery, which is also commonly known as the Golden Palace Monastery. Browse places to stay in Mandalay on Agoda.com. Free cancellation. The well-preserved, all-teak structure is covered in intricately carved figures from Buddhist mythology, and has become a valuable stop for those looking to absorb Mandalay’s rich history. First built as part of the royal palace in Amarapura by King Mindon’s artisans, this royal home coated in gold leaf and glass mosaics was dismantled in 1857 and transported to the new palace complex in Mandalay. When his father died inside these chambers, King Thibaw was afraid of being haunted by bad spirits, so he dismantled it once more in 1878 and reconstructed its basic teak structure as a monastery on its current grounds. This move saved it from the bombings that levelled Mandalay’s palace complex during World War II. Today, Shwenandaw Monastery is a monastery in name only, as no monks actually inhabit the beautiful building that has become a popular attraction for tourists, photographers and history buffs. The outside carvings are in different weathered and restored states, with glimpses of faded gold leaf patches. The inside carvings and panels are in better condition due to their protection from the elements, and display the tales of Buddha’s life. Only men are allowed to enter and worship the Buddha image in the main room, displayed alongside nat spirits. Mandalay’s US$10 combo ticket is required to enter the grounds. Only a few hundred metres from the palace complex, it makes for a good and easy stop along your royal itinerary. The massive and modern Atumashi Kyaung Monastery is also only a quick walk away, but it’s rarely used and is usually vacant except for visitors. Shwenandaw is located to the northeast of the palace compound on 14th Street between 62nd and 63rd Streets. It’s close to Kuthodaw and Sandamuni pagodas as well as Mandalay Hill, so they’re best grouped together on the same trip. It’s a lengthy but interesting hike from most downtown hotels, or an easy cycle. If you negotiate with a taxi driver you should get all those sites for around 15,000 kyat. Shwe Kyaung is officially covered by the 10,000 kyat combo ticket and when we last visited the ticket booth was occupied.